Bad Saint is a twenty-four seat (mostly stools) Filipino restaurant located in the Columbia Heights neighborhood. In 2016, Bon Appetit named it the #2 New Restaurant in America and Michelin recently awarded it a Bib Gourmand. Open for about 3 years now, this little shop that use to be "wait-in-line-for-a-seat only" most recently started accepting limited reservations online, so we were able to score a table this winter's evening. The mood inside is crowded and boisterous with pop music playing loudly. Squeezed in a short hallway that leads to the bathroom, our stools faced a mirrored wall, so you could see the server as they approached behind you. There were quite a few items on the menu that looked good, but knowing it was larger shared plates style, I didn't want us to go overboard. 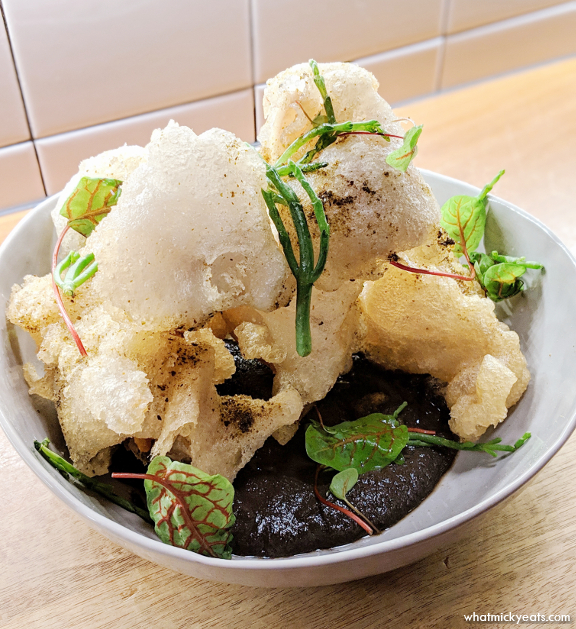 We started with the Piniritong Adobong Pisit - fried squid cooked in vinegar, served with long pepper and sea beans in a pureed spicy and tangy adobo sauce that was addictive. The squid was tender and chewy and had a nice light coating. A minor complaint was that the pieces were a bit too large to eat in one bite, and it was hard to cut with only a fork and spoon that are your utensils. Also beware of the fried pieces of long pepper mixed in. They were spicy! Nevertheless, this was an upscale bar snack priced at $22 that paired perfectly with the sour ale that Keith ordered. Surprisingly, it took quite a long time for our next course to come out. Two parties next to us were getting served multiple times before us, which left me wondering had we been forgotten? Our server noticed, and sent over a complimentary dish of Ensaladang Ifugao. 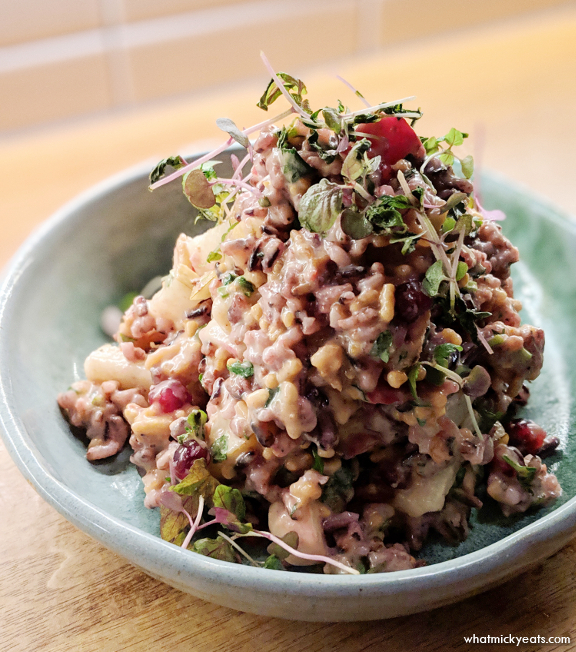 This $18 cold salad of purple rice, Asian pear and pomegranate had great flavor and texture from added puffed rice. It was a nice treat to hold us over until our main dishes arrived. 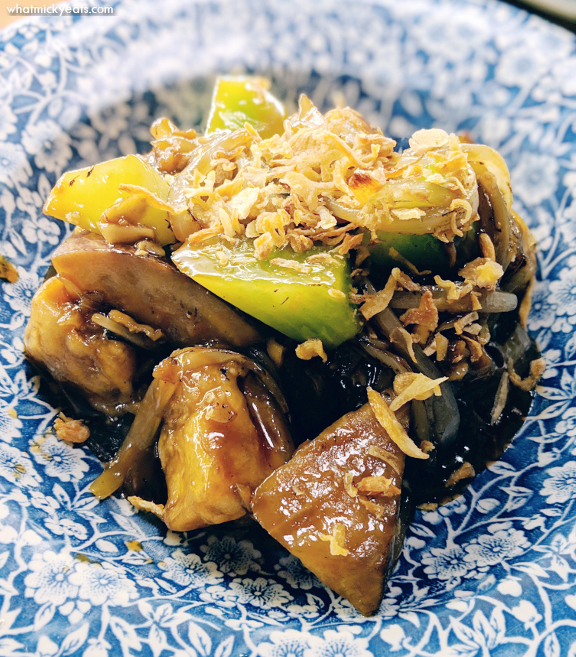 I really wanted to try the Ginisang Gulay - eggplant and celtuce with fried tofu in a brown sauce. This $24 vegetarian dish was delicious but had more Chinese flavors than Filipino. I ate it all alternating between regular Jasmine rice and the Ifugao diket (purple rice). 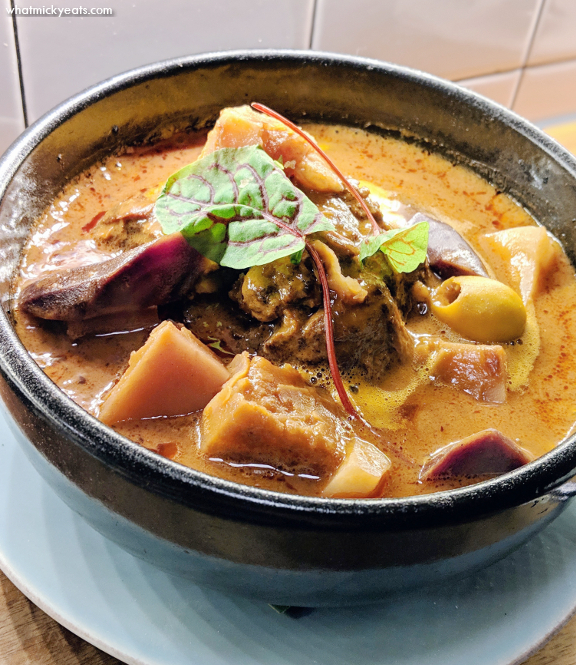 Keith ordered the hearty Kaldereta - a hot stew of lamb neck, chicken liver, and root vegetables like carrots and sunchokes. The broth was spicy and fragrant, and had an extra sour quality from the added olives. The rice added to the potato-like sunchokes to make this dish quite filling. He only wished for a bit more of the chicken livers, as it seemed they disintegrated into the hot broth. Priced at $43 this was one of the most expensive items on the menu. All in all, despite the small venue and long wait for our food, we enjoyed everything that was served. We appreciated the other regional Filipino ingredients that were featured, and the modern spin on traditional dishes. Also, the hospitality was above par, and I noticed servers explaining menu ingredients with ease to first-time diners. Now that reservations are available, it makes this award-worthy food all the more accessible.